Today, the New York State Quarter Coin remembers the first person to go over Niagara Falls in a barrel and survive on October 24, 1901, her 63rd birthday. A widow, Mrs. Anna Edson Taylor, safely passed over Niagara Falls in a barrel on Friday, October 24, 1901, the trip from end to end being witnessed by several thousand people. The fact that Mrs. Taylor failed to appear, as advertised, on the Sunday before, and again on Wednesday, did not lessen the confidence of the public. It was beyond belief that she would live to tell the story, but she came out alive and well so soon as she recovered from the shock. This initial voyage over Niagara’s cataract began at Port Day, nearly a mile from the brink of the Falls. At this point the daring woman and her barrel were taken out to Grass Island, where she entered; at 3.50 she was in tow of a boat speeding well out into the Canadian current. Soon after the barrel was cast adrift on the current that never before was known to spare a human life once fallen in its grasp. From the spot where the rowboat left the barrel the current runs frightfully swift, soon boiling on the teeth of the upper rifts; the barrel was weighted with a two hundred pound anvil, and it floated nicely in the water, Mrs. Taylor apparently retaining an upright position for the greater part of the trip down the river and through the rapids. Fortunately the cask kept well within the deep water, and except for passing out of sight several times, in the white-crested waves, it was in view for the greater part of a mile. In passing over the Horseshoe Fall the barrel kept toward the Canadian side at a point three hundred feet from the centre. It dropped over the Fall at 4.23 o’clock, the bottom well down. In less than a minute it appeared at the base of the Fall, and was swept downstream. The current cast it aside in an eddy, and, floating back up-stream, it was held between two eddies until captured at 4.40 o’clock. As it was grounded on a rock, out in the river, it was difficult to handle, but several men soon had the hatch off. Mrs. Taylor was alive and conscious but before she could be taken out of the barrel it was necessary to saw a portion of the top away. Her condition was a surprise to all. She walked along the shore to a boat, and was taken down the river to the Maid of the Mist dock, where she entered a carriage and was brought to Niagara Falls. The woman was suffering greatly from the shock, and had a three-inch cut in her scalp, back of the right ear, but how or when she got it she did not know. She complained of pains between the shoulders, but it is thought that this was due to the fact that her shoulders were thrown back during the plunge, as she had her arms in straps, and these undoubtedly saved her neck from breaking. She admitted having lost consciousness in passing over the Falls. While thanking God for sparing her life, she warned every one not to repeat her foolhardy trip. So severe was the shock that she wandered in her talk, with three doctors attending her; she, however, soon recovered. Mrs. Taylor was forty-three years old when she made this marvelous trip. She was born in Auburn, N. Y., and was a school teacher in Bay City, Mich., before she came East. She had crossed the American continent from ocean to ocean eight times, and during her stay East impressed everybody with her wonderful nerve. The barrel in which Mrs. Taylor made the journey was four and one-half feet high, and about three feet in diameter. A leather harness and cushions inside protected her body. Air was secured through a rubber tube connecting with a small opening near the top of the barrel. Her warning evidently has been heeded. 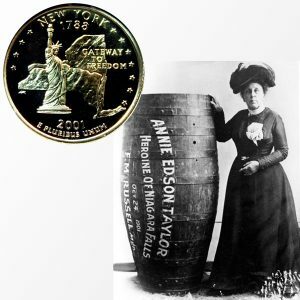 The New York State Quarter Coin shows with an image of Annie Edson Taylor posing beside her barrel.